Everyone wants their device to be as secure as possible. When you’re setting up the iPhone 6 it will ask you if you want to enable Touch ID - we recommend doing this - as it’s simple and effective. You’ll also be prompted to set up a 4-digit passcode as default but you should take steps to beef this up. Let’s put it into context. Say you’re on a train and the person looking over your shoulder sees you tap in your 4-digit pin. Now if this unscrupulous so-and-so happens to be a thief, you’ll have a problem as they'll know the passcode to access your device once they pinch it. To make it harder for people to access your device Go to Settings > Touch ID & Passcode and then switch off ‘Simple Passcode’. You’ll be prompted to enter a longer password with the ability to use alphanumeric characters. We recommend using three memorable words as a long password is a strong password. Using a long password may seem like a drag but, with Touch ID enabled, most of the time you'll be unlocking the device or paying for apps via a thumb print. The strong password is there to give you peace of mind if the device ever goes missing. There’s also another option for users who carry around sensitive information on the device. 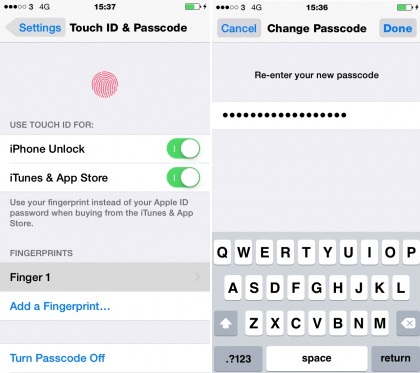 You can set the device to wipe all data if the passcode is entered incorrectly 10 times. This is a nice failsafe and can be activated via Settings > Touch ID & Passcode > Erase Data.